To our knowledge, no peer-reviewed publications examine the scope of SDH screening practices in primary care settings in general or in HCs specifically—where health care providers may be at the forefront of integrating SDH considerations into practice. To address this knowledge gap, an academic-community partnership was forged between researchers at the University of Michigan and the Michigan Primary Care Association, a statewide consortium of HCs in Michigan. Together, we examined (1) current screening practices for SDH across Michigan HCs, including the number and types of SDH domains screened; and (2) settings in which screening was administered, and by whom. Map of Michigan Health Centers. This research did not involve patient data. This study was deemed exempt from human subjects review by the University of Michigan Institutional Review Board. Using recommended SDH domains from the National Academy of Medicine, Centers for Disease Control and Prevention, and World Health Organization as a starting point, we used an iterative deductive approach to generate an empiric set of core SDH screening domains and subdomains, which we then used to code all collected screening forms.7,9,21,22 We first reviewed national initiatives, consensus statements, and expert recommendations regarding SDH screening in order to identify existing screening domains. We then piloted and revised our preliminary SDH domain codes using a sample subset of screening forms in order to create a comprehensive coding scheme for identifying and categorizing SDH screening questions. “Core domains” represented large cohesive themes that comprised more specific or detailed screening questions. Frequently used and more specific screening items were considered subdomains. Content analysis is a systematic means of describing and quantifying written, visual, or verbal data into parsimonious categories that can be analyzed with statistical methods.23,24 It is also frequently used as a method for analyzing documents whose primary intent is not to collect data for analytic purposes.23 Three coders (EB, AJC, MCH) used content analysis to assign SDH domains to each screening document. A minimum of 2 coders independently reviewed 65% of all screening documents. Concordance for code assignments between each coding team pair was ≥95%. All 3 coders collectively reviewed any differences in coding, which were resolved through consensus. We decided a priori that any document or question with the apparent sole purpose of medical care or billing was not considered an SDH screening item per se, but rather part of the routine services provided by the HC. Examples of excluded documents include forms screening for sexually transmitted infections and questions about immunization history or autism spectrum disorder. While these documents may include questions that could be coded using our SDH domains, the intent of these types of screening is diagnostic, rather than to identify social needs. Documents that were used to determine financial resources explicitly for billing purposes, such as a sliding-fee application, were also excluded from our SDH coding analysis. We included items as having an SDH screening intent if they were asked in the context of other social circumstances, rather than in a medical context. For example, in a section that included questions about living situation, nursing home residency, and roommates, a question in the same section asking about functional status or recent falls would be coded as an SDH screening item. Codes were assigned to individual screening questions, subsections of documents screening for particular needs, or entire documents with a single screening intent. As an example, many HCs submitted forms that included evidenced-based screening instruments for depression and anxiety.25⇓–27 While these documents include individual questions within a given instrument or scale that could each have received separate codes, because these scales are intended to be administered as a unit, we instead assigned a single code to the entire scale. For example, the 9-item Patient Health Questionnaire is a validated depression screen that includes a range of questions about mood, sleep, energy, agitation, appetite, concentration, and suicidality; we assigned to all 9 questions in the document a single code for depression screening. We analyzed the content of screening documents from 59% of HCs (n = 23); these represented 167 delivery sites (mean number of delivery sites per HC organization, 8; range, 1–25) across the state of Michigan who responded to our request for screening documents. Characteristics of responding HCs and their corresponding patient populations are presented in Table 1. We received screening forms from HCs representing all geographic regions of the state. Of the participating HCs, 6 (26%) had delivery sites in rural locations (based on ZIP code), all of which were in the northern and middle regions of the state. A total of 16 HCs (70%) were in urban settings, and 1 HC (4%) provided care in both rural and urban areas. The HCs employed a mean of 9.0 full-time equivalent physicians (range, 0–21.6) and a mean of 5.3 full-time equivalent mental health providers (range, 0–48.1), who included substance use disorder counselors, psychiatrists, licensed clinical psychologists, licensed clinical social workers, and other mental health staff. Responding HCs had a total of 1,118,557 medical visits (mean, 50,844; range, 1,342–96,236) and 96,377 mental health visits (mean, 4,381; range, 0–36,495) in 2014, corresponding to 459,313 unique patients—or 75% of all patients seen by HCs in Michigan in 2014. The patient population served by responding HCs was 56% female, and the majority was non-Hispanic white (56%). Over two thirds (70%) of patients had incomes ≤200% of the federal poverty level; 51% had health insurance coverage from Medicaid, the Children's Health Insurance Program, or other government-sponsored coverage, and 21% were uninsured. A total of 4% of the patient population represented was homeless. Notably, important differences were found in mental health services, insurance status, racial and ethnic composition, and rural/urban representation between geographic regions in our HC sample. Medical services provided and prevalence of homelessness showed similarities across regions. Table 2 presents the 15 core domains identified empirically from all submitted HC screening documents. Those domains are (in alphabetical order) Culture, Demographics, Economic Indicators, Education, Employment Status, Family/Living Arrangements, Functional Status, Health Care Access, Health-Related Behaviors, Language, Material Hardship, Mental Health, Social Support, Trauma/Violence, and Veteran Status. Broadly, these core domains demonstrate substantial alignment with multiple national initiatives to identify best practices for screening for SDH.7,9,21,22,28 However, we identified 1 core domain (Culture) that was not represented in any of the referenced national initiatives (Table 2). Participating HCs screened for a mean of 11 of the 15 core domains (range, 6–15) (Figure 1). In addition to the core domains, we identified 102 subdomains (Table 2). All responding HCs screened for 4 core domains: Employment Status, Mental Health, Family/Living Arrangements, and Demographics. The majority of participating HCs also screened for Language (n = 22; 96%), Material Hardship (n = 22; 96%), Veteran Status (n = 21; 96%), Economic Indicators (n = 21; 91%), Education (n = 21; 91%), Health Care Access (n = 22; 91%), Social Support (n = 21; 91%), Trauma/Violence (n = 21; 91%), and Health-Related Behaviors (n = 17; 74%). The domains least frequently included in our screening sample were Culture (n = 9; 39%) and Functional Status (n = 8; 35%). HCs screened for a mean of 48 subdomains (range, 21–98); the number of subdomains included in the HCs' screening forms varied. Supplementary Table 1 online outlines the number of and variation in screening for all subdomains identified across participating HCs. Certain subdomains were universally included by all HCs that screened for the corresponding core domain. Percentages of health centers screening for core domains. Modes of SDH screening varied across our sample (Figure 2). HCs (41%) most frequently reported that information was self-reported by either the patient or the patient's parent. For the majority of HCs, there was a wide representation of staff and provider team members (eg, “other” personnel [24%], medical assistants [22%], social workers/case managers [18%], health care providers [16%], front desk staff [12%], registered nurses [10%]) who also administered screening forms to patients and parents. Information was collected with equivalent frequency (40%) before, during, or after a visit. 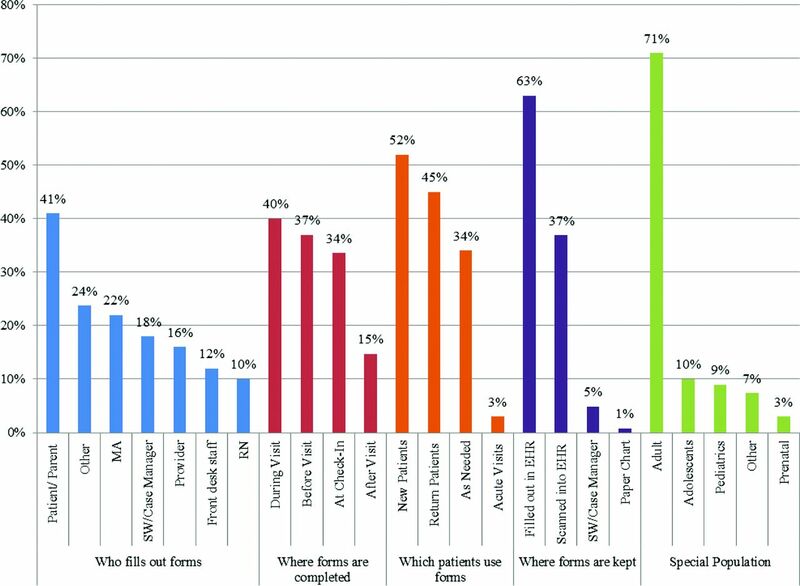 New patients were most frequently targeted for screening (52%), but screening was also performed 45% of the time for returning patients and 34% of the time “as needed.” Most of the HCs (63%) used an electronic health record to record screening results directly, and another 37% scanned completed paper forms into the electronic health record. Adult patients were more often targeted for SDH screening across all participating HCs (71%) than were children, including both pediatric and adolescent visits (19%). The remaining populations screened by HCs were considered “other,” which includes prenatal visits (11%). Many documents were used in >1 category of screening and were not mutually exclusive, so totals may sum to >100%. Health center data collection survey results. Categories are not mutually exclusive and may total >100%. EHR, electronic health record; MA, medical assistant; RN, registered nurse. This study is, to our knowledge, the first of its kind to investigate systematically how SDH screening is incorporated into routine clinical practice at sites likely to provide care to predominantly disadvantaged patient populations. Our assessment of current SDH screening practices across Michigan demonstrates that HCs across the state are routinely implementing SDH screening into clinical care across many domains, and that there is broad de facto consensus regarding core domains, despite regional differences in the populations served and the services available. Further, the 15 core domains we empirically identified are largely aligned with recommended screening guidelines established by multiple national and expert bodies.7,9,21,22,28⇓–30 We found variation across HCs, however, with regard to (1) the mode of screening administration and (2) the range of subdomains included. Future work should focus on understanding how and why screening processes differ between HCs, and what, if any, relationship the variation in screening administration has to local populations or resource availability. Among the 15 core domains identified, not all were routinely included in screening. In fact, only 4 (Demographics, Employment Status, Family and Living Arrangements, Mental Health) were included in the screening documents submitted by all HCs in our sample. Among all responding HCs, 74% screened for health-related behaviors, which included subdomains to screen for alcohol use, tobacco use, or drug use (Table 2). The lack of universal screening for health-related behaviors was surprising, given the existence of evidence-based instruments to screen specifically for alcohol and tobacco use,31,32 as well as expert panel recommendations to screen for these issues in a clinical setting.29 It is possible that HCs that did not include items regarding health-related behaviors in the screening forms they submitted, with the implicit expectation that these topics are addressed as part of the clinical visit. Further work to understand how HCs, providers, and other members of the care team define and screen for SDH will be important in generating consensus for SDH screening instruments. Moreover, clarity in common approaches to screening for SDH can facilitate the efforts of public health officials and policymakers who wish to advance SDH principles and practices. While increasing evidence suggests that screening for SDH uncovers previously unidentified needs and increases referrals to social services,33,34 evidence is still lacking to link screening for SDH with improvements in health outcomes. Concerns exist that screening for social issues that cannot be addressed may cause unintended harm in the doctor-patient relationship.35 Thus, evidence is still needed to assess the association of screening for SDH with patient health outcomes and quality of life. Yet, as SDH increasingly move under the umbrella of health and health care, it will be important to ensure screening practices are methodologically sound and evidence-based. The identification of core domains already in use in HCs across a large and diverse state is an important first step toward a goal of a unified approach to SDH screening for large-scale implementation. Before this study, 3 state-initiated concurrent projects were being implemented to better understand and address issues related to SDH in Michigan.36⇓–38 Yet limited knowledge was available regarding how relevant SDH data were being collected. Both in Michigan and nationally, consistent measures are greatly needed to monitor SDH across a national population of differing communities, values, and resources.15 Selecting these measures will be critically important to ensure proper monitoring of and feedback on how HCs and other providers identify needs and take necessary action steps to improve health. Core domains will allow for trackable metrics across communities to monitor individual SDH, population health, community needs, available ancillary services, and allocation of resources. Identifying core domains will allow policymakers and community stakeholders to determine whether new programs are having their intended health impacts. Without consistent measures across communities, the ability to monitor the influence of SDH on health outcomes, health care utilization, and costs will be limited. In addition, uniform core measures allow for increasing leverage of SDH data in the current landscape of changing payment reforms. Our study had several limitations. First, our data were collected at the HC organization level. Each HC organization is responsible for managing and overseeing multiple delivery sites. While the HC organization has specific knowledge of overall policy and procedures across sites, the use and incorporation of screening documents in the workflow may vary at each individual delivery site, and we were unable to capture this variation. Second, likely some variation existed in HC organizations' interpretation of what constituted an SDH screening document. The number of screening documents submitted varied across HCs, as did the nature of the submitted documents. Some HCs submitted a large number of medically related screening forms in addition to SDH screening forms, whereas others submitted only documents related to an ongoing demonstration project in the state that uses an evidence-based questionnaire.36 Therefore, our data are limited by how each HC interpreted the request for screening forms. In addition, our data were collected from FQHC and FQHC look-alikes, rather than all primary care practices in the state. 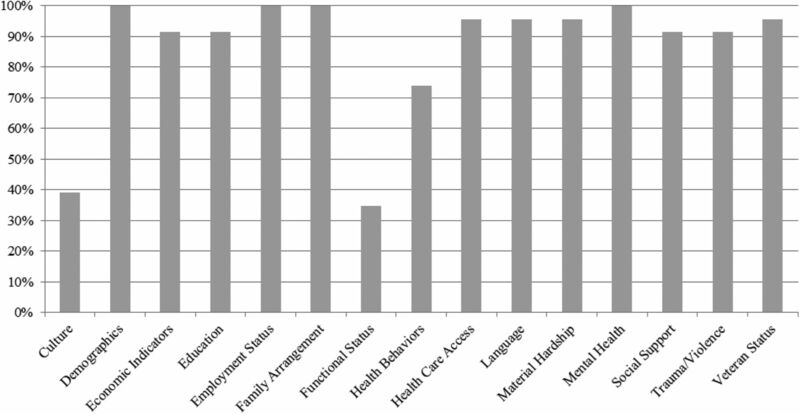 While this may limit the generalizability of our findings across all types of medical practices, HCs serve the highest proportion of low-income patients at risk for unmet social needs.39 Therefore, examining SDH screening practices at FQHCs and similar delivery sites is a relevant starting point for gathering data about evidence-based screening practices. Our data were gathered in one Midwestern state. While Michigan is a large state with HCs that serve a broad mix of urban, rural, tribal, and migrant communities, it is possible that the practices of HCs in one state may not be generalizable to other states. Finally, we present a descriptive analysis of a sample of HCs and their patient populations and resources by geographic region, rather than examine or suggest associations between screening practices and HC demographics. To investigate such associations would require a larger sample of HCs. The National Academy of Medicine guidelines represent foundational work assembling a core set of brief, standardized measures for SDH screening.7 Our work suggests that many of these recommendations are already in practice in many HCs across Michigan. Given the increasing emphasis on addressing community health needs by Medicare, Medicaid, and other commercial payers,8,40 there is an urgent need to develop best practices for identifying and addressing SDHs. Understanding the current landscape of screening for SDHs in a large and diverse state is an important first step toward identifying which SDH data may be most relevant to collect and understanding how best to collect them. Recognizing that HCs are providing health care to a large proportion of at-risk individuals and communities, the core domains identified are aligned with recommendations by national expert panels, and they provide a useful starting point for building consensus about the necessary components of SDH screening and how best to incorporate evidence-based items into successful current practice. Future work should focus on understanding variation in screening across practices, how screening may be influenced by both perceived patient needs and the availability of HC and community resources, approaches to addressing unmet needs once they are identified, and how screening may be used to improve clinical care delivery and population health outcomes. The authors thank the Michigan Primary Care Association, in particular Kim Sibilsky, Lydia Starrs, and Joe Tran, for providing invaluable help. Thank you to all participating Health Centers in the state of Michigan. EB and AJC are co–first authors. Funding: This research was funded in part by the Michigan Institute for Clinical & Health Research (grant UL1TR000433), and by the Robert Wood Johnson Foundation Clinical Scholars Program (EB and AJC). To see this article online, please go to: http://jabfm.org/content/30/4/418.full. Accepted for publication March 5, 2017.